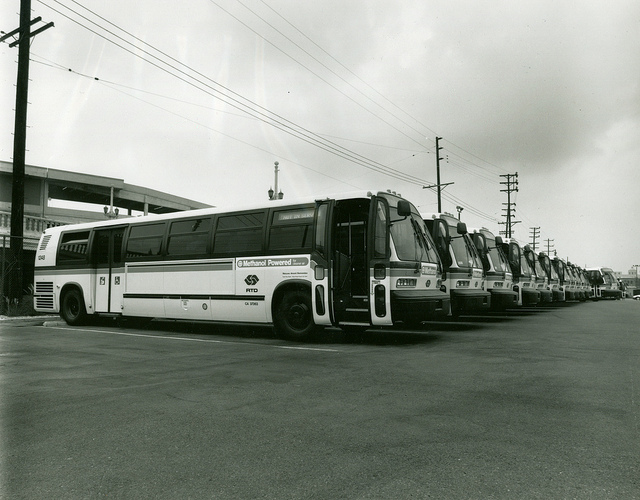 A fleet of Los Angeles buses, circa 1992, capable of burning methanol and ethanol. A substitute for gasoline, methanol can be produced from natural gas, which has recently become cheap enough to spark new interest in the alternative fuel. A fleet of Los Angeles buses, circa 1992, capable of burning ethanol and ethanol. An alternative to oil, methanol can be produced from natural gas, which has recently become cheap enough to spark new interest in the alternative fuel. America has become the “Saudi Arabia of natural gas,” according to President Obama, and one former director of the Central Intelligence Agency would like to use that fossil fuel war chest to break our ties with imported oil, an addiction that costs the nation $1 billion per day. R. James Woolsey, former CIA director and self-proclaimed energy hawk, would like another option at the gas pump: methanol. He said last week at the Chicago Club that the Organization of the Petroleum Exporting Countries (OPEC) has so tight a grip on global gasoline prices that the U.S. will never drill or conserve its way out of funding Middle East petro-states. But with natural gas at a fraction of the price of oil, it may have another way out. Woolsey, who has solar panels on his farmhouse and owns two electric cars, said methanol, also known as wood alcohol, could replace gasoline with relative ease. Oil processing facilities take in crude oil and break it down into gasoline that can be burned in cars. But it’s also possible to synthesize methanol and other fuels from less valuable components. Until fracking helped plunge the price of natural gas to less than a third of the price of oil, that method was too costly to be worth it. “Right now we have a mandate from OPEC and the car companies that we only use oil-based fuels,” Woolsey said. A 2011 report from the Massachusetts Institute of Technology found producing methanol to be an attractive end-use for natural gas. The report also said it would cost auto manufacturers less than $90 per car to retrofit vehicles so they can burn methanol. Woolsey said that&apos;s less than the cost of a seatbelt. Add that to estimates of how much it would cost to build or retrofit refineries and fueling stations that would be capable of supporting a system like the one Woolsey envisions, and the MIT study says methanol would cost roughly $2 per gallon of gasoline equivalent. Ernest Moniz, who chaired that study, is awaiting confirmation as President Obama’s next secretary of energy. He has taken heat for failing to disclose that some of the study&apos;s researchers had already accepted positions with gas companies when they offered the report, which was bullish on the future of U.S. natural gas production. Coming from the CIA, Woolsey’s main interest in methanol was as a means to defund dictatorships who use oil revenue to placate and suppress their people. Methanol can also be made from coal, biomass or even CO2. As a way to tackle climate change, however, methanol may not be so attractive. Moniz’s MIT study estimated natural gas could be converted to methanol with about two-thirds efficiency, which leaves it with a greenhouse gas footprint close to gasoline. The climate impact of natural gas production has already been called out for methane leakage problems, a scientific debate that roars on even as the U.S. drills tens of thousands of new wells each year, and states like Illinois move to open more. There’s another scarce resource in play: time. Retrofitting all the infrastructure it would take to produce and pump methanol into a new fleet of American cars would take years. President Obama has seized on figures that the U.S. may have 100 years of natural gas, but declining production in some areas has called that claim into question. Even if cheap gas lasts only 20 years — though it might not be long enough to overhaul transportation infrastructure — it could be long enough to put us over a climate threshold for "dangerous" climate change. Many environmentalists would rather see that time spent deploying renewable energy.